If you google Native Science chances are you will land on the name Gregory Cajete, one of the foremost scholars who teaches and writes about indigenous ways-of-knowing. Cajete talked to an audience at our university this week and illuminated how we can practice sustainability by embracing native epistemologies. Cajete used metaphors to illustrate how native ways-of-knowing can be applied today. He showed a picture of a 1000-year-old Anasazi bowl where the image of the crane and human are entwined, illustrating how our paths are conjoined, that we live an interdependent existence. Rather than dismissing Western science (Cajete is a biologist) the speaker focused on how native values can better sustain us: a sense of place and community, care for others, non-monetary exchange of values, and ecological integrity. “You need a vision. You need a purpose.” Some folks might bristle at the suggestion, but Cajete noted that we need a spiritual purpose, and that spirituality is not necessarily the same thing as religion. Having a spiritual purpose gives us agency, he said. Cajete showed an image of an ear of corn and said that each kernel represents a future plant: each kernel contains the elements needed for another stalk of corn. 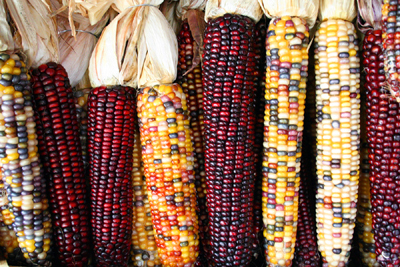 But each kernel is surrounded by other kernels: a visual metaphor of independence and interdependence. This entry was posted in authenticity, Indian, Native Science and tagged Indigenous Science, native science. Bookmark the permalink.